Opening today in select Cineplex theatres across Canada as well as being available on VOD tomorrow is this delightful, bloody, and funny film that pays homage to all those sci-fi actioners and not quite family adventure films of the 80s and 90s. Watching this one, I was reminded of so many bad titles that found their way into the family VCR while I was growing up. 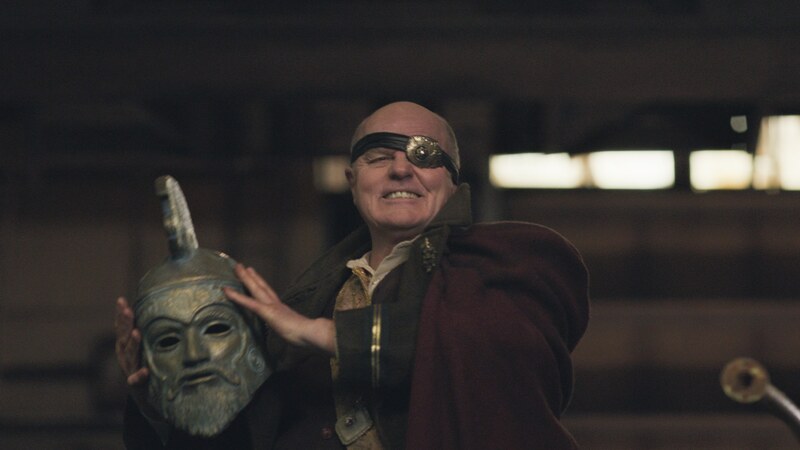 Playing like a fevered dream of some 80s survivor (like yours truly), Turbo Kid is set in the distant post-apocalyptic world of 1997, The Kid (Munro Chambers) survives as a scavenger in the wastelands. Riding his BMX, accompanied by an 80s-style, Carpenter-influenced score, he soon finds himself enmeshed in an adventure beyond his imaginings in what is bound to become a crowd-pleaser for cult-film fans. With his viewmaster hanging around his neck, and his love of Turbo Rider comics, he is completely unprepared for the excitement that is thrust upon him when he meets a strange girl named Apple (Laurence Leboeuf). The pair stumbles into trouble when they are attacked and chased by some Road Warrior wannabes on BMXs, and one baddie that looks like one of the three storms from Big Trouble in Little China. Apple gets captured, and taken to the villainous Zeus (a scene-chewing Michael Ironside), who rules his small corner of the wasteland with an iron fist, and executes enemies with his own personal Thunderdome. The Kid sets off to rescue his friend, with the aid of his newly found body armor and power glove! From there its all cheesy, bloody fun, that embraces and revels in the nostalgia of those horrible, yet beloved 80s and 90s direct to video favorites. Filled with slightly familiar lines, I couldn’t help but laugh aloud when Apple proclaims, This is my gnome stick! I had so much fun with this film, because it refused to take itself too seriously. I mean it took itself seriously in the reality it was based, but both the filmmakers and the audience knows there are lots of winks and nudging go on. The violence is so gruesome and blatantly over the top, that I caught myself applauding in delight. This film is just stupidly fun. And that sentence perfectly captures the experience. Don’t go in expecting some titanic work of cinematic glory, this movie is supposed to be bad (but in a good way), it’s plot is simple, the moments are priceless, and it honestly looks like everyone is having an amazing time. You see shadows of Solarbabies, Captain Power, Spacehunter, Metalstorm, and if you know any of those titles without having to pull up IMDB, then you are definitely the target market for this film. It felt like I had slipped back in time, to some Saturday evening, during my less than social teen years, and pushed this tape into the my player, and just loved every moment I was privy to. So if you miss those goofy days of sci-fi where your enemies could explode in a geyser of blood, or have a head blown off by a circular saw, all while saving your only friend in the universe, then have a look at this one… and share it with friends.